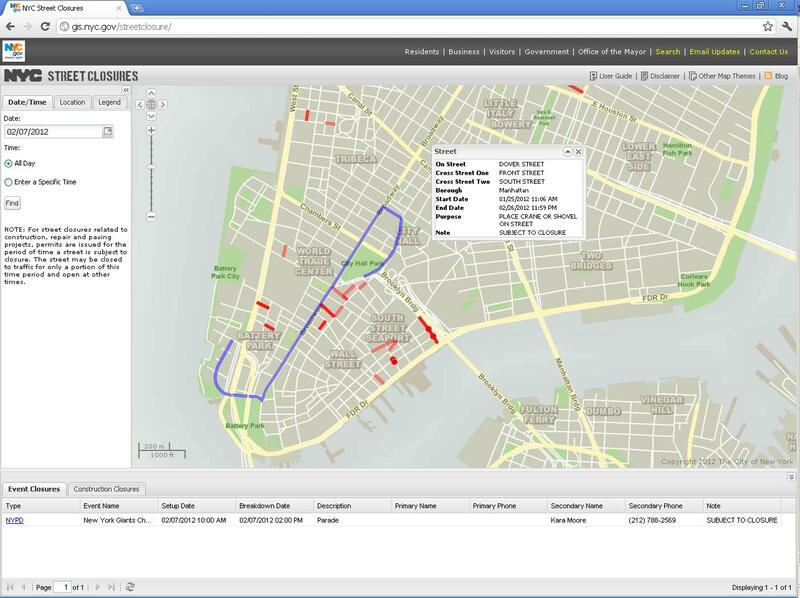 The NYCityMap current release includes a major revision to how searching is undertaken. After receiving numerous feedback and suggestions, we implemented a greatly simplified search function. The previous search function remains but has been changed to an Advanced Search. Instead of requiring users to specify a search type, a single-field entry has been implemented with this release. The application parses (i.e., separate into its individual component parts) the input to this single field to determine the search type and then executes the search. Search input that can be parsed and is not ambiguous (e.g., same address in multiple boroughs but the user did not include the borough), will center the map on the search location. Input that cannot be parsed or for which a match cannot be found, will generate an error message in the Advanced Search widget. If the search results in multiple candidate locations, these will also be presented in the Advanced Search widget as suggestions. Each suggestion can be clicked on to perform the suggested location search. See the example below for the search ‘2 Broadway’ that returned three suggestions. We’ve also improved how our suggestion list is populated in the hopes that we’ll be able to suggest the location you did intend to enter in the event of a typo or incomplete information. All candidates are pre-validate before being presented. In addition to simplifying the user interface, the simplified search form requires less input information to execute a search. For example, the borough is not required as was previously the case although one can be provided to prevent any possible ambiguity – see previous screenshot. The NYCityMap logo was also updated with this release. In the previous release users were unable to add the result of an identify within Staten Island to their search history. This has been resolved in this release. DoITT GIS in collaboration with its partners the Department of Transportation (DOT) and The Mayor’s Office Citywide Events Coordination and Management (CECM) and in conjunction with the City Council recently launched the Street Closures application. This interactive mapping application shows all current and planned full-street closures in New York City and is filterable by date, time and location. Planned street closures are present at least one week prior to its start or if less lead time is known, as in the case of the NY Giants parade, as soon as possible. Construction and event (e.g., parades and street fairs) related street closures are presented on the map and in tabular view. Clicking on a record in the table will center the map on that closure while clicking on the closure on the map will highlight the record in the table. Basic information about the closure is provided in the table and in a pop-up window as seen in the screenshot below. The application was developed using open source technologies including OpenLayers, GeoServer, GeoWebCache and GeoEXT. The street closure application shares the same base map tiles as NYCityMap and geocoding service.